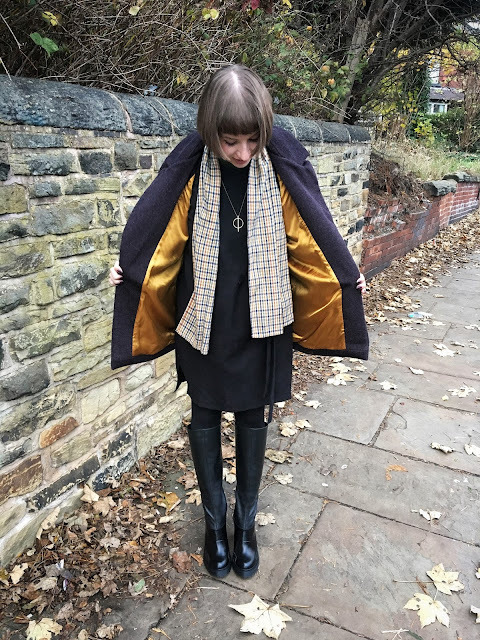 Another one ticked of the seasonal sewing list - here's my winter coat: the Named Clothing Yona Wrap Coat. 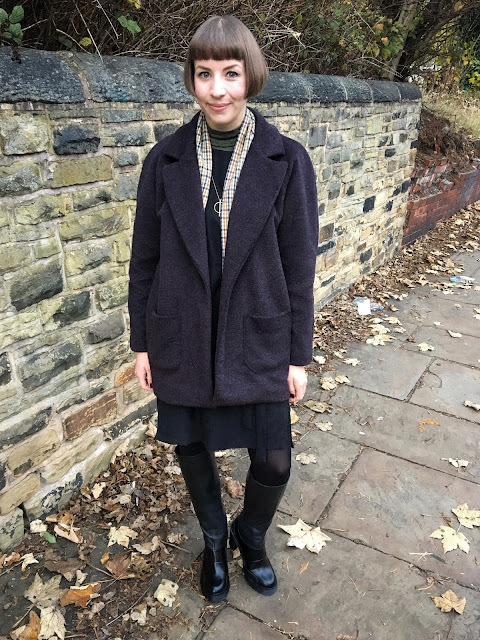 This one was a challenge, and whilst I like it very much and it grows on my every day, I couldn't quite call it my 'dream coat'. In fact, I have no idea what I would actually define to be a 'dream coat', so considering that, it's not turned out too bad for a first effort. Plus it's made up in lovely fabrics and colours, and in more practical terms... it's warm! I committed to making a winter coat a while back - even recycling my old one to give me 'the fear'. 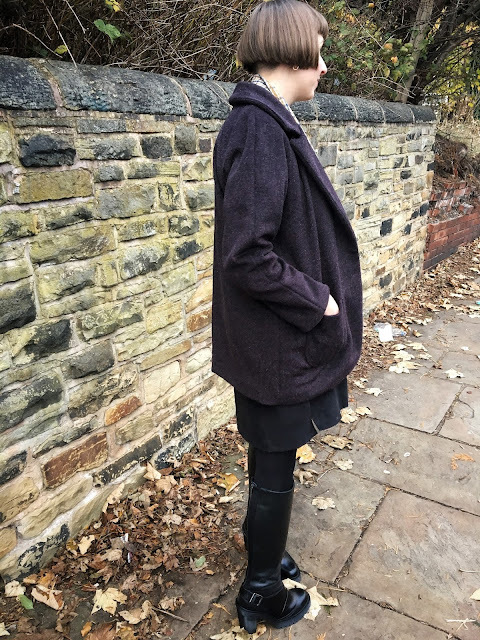 Without really knowing what style I wanted, or scouting out suitable fabrics available to buy, I impulse-bought the most beautiful, textured, dark aubergine, wool mix (70% wool, 30% polyamide) from Barry's whilst at Sew Brum. 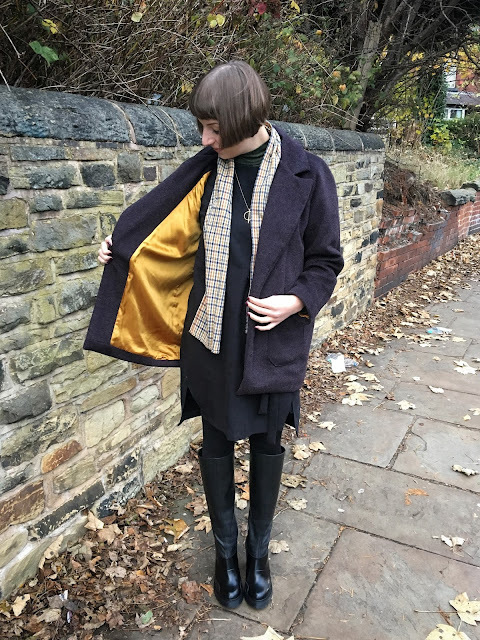 I bought 2.5m (at £13.95 p/m) with the encouragement from my fellow Sew-Brum-ers that it should be enough to make my mystery coat. The pattern choice came later, and again, I wasn't really sure what I was looking for. I plumped for the Yona in the end, as a bit of a safe bet (I'm fairly confident in the fit of Named patterns/using their instructions). Having sewed up my first piece of outerwear quite recently - the Waver Jacket - I was perhaps a little less daunted than I usually would be with a big project like this. There was quite a bit of prep involved - as there was with the Waver - including applying more interfacing than I've ever used in one garment. 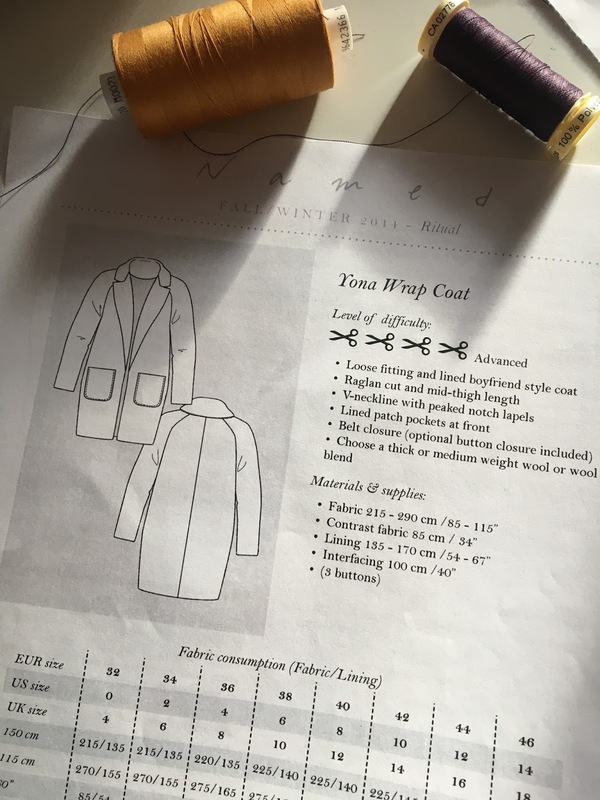 By chance, I'd also read The Thrifty Stitcher's Tips for Making Winter Coats post, which I would 100% recommend checking out. The recommendation for using a walking foot to tackle the bulky layers is definitely one to put into action. The pockets were quite difficult to attach neatly, whilst ensuring that none of the pocket lining was exposed. I made this just a little bit more difficult for myself by choosing a super-contrasting gold lining (the boldest they had in Fabworks). If you look very closely at a funny angle, you'll probably see some gold peaking out in places, but I can live with that. Attaching the facing, shell and collar together has to be one of the most challenging bits of sewing I have ever undertaken. The bulk of all those layers really tested me and my machine to the limits, and I definitely had to attempt it more than once. The pattern doesn't suggest it, but I would recommend hand basting the whole thing together before starting. In hindsight, it seems like an amateur move from me for not doing it to start with and just following the instructions blindly, but hey, you live and learn! The rest of the coat came together pretty quickly. 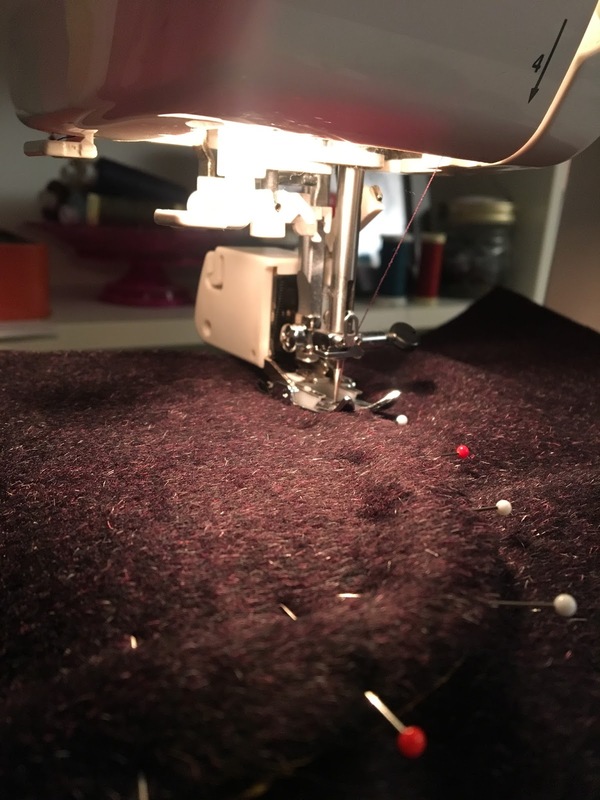 I had a bit of difficulty matching and inserting the lining - there seemed to be excess lining fabric at the front/top of the facing that I had to ease stitch in, and not enough notches! I was more nervous about turning the whole coat out due to previous bagging out confusions, but had no problems at all. One thing I will take into consideration in future is choosing a better quality lining fabric. Having seen how easily this one frayed while working with it, I now understand how the lining on some high street coats ends up shredding after a while. Now to explain the title of the post, and my one big dislike about the coat: the wrap belt. As a fastening, I just don't think it sits well in balance with the length of the coat, and the soft cocoon shape of the body. The finished garment is shorter than I anticipated, so I would add a good few inches if I was to make it again - maybe then I would be happier about the wrap belt? On the plus side, I love the coat shape when it's worn open. I would like to add some sort of discreet fastening to hold it closed at the centre front - what do you think would be the best option? 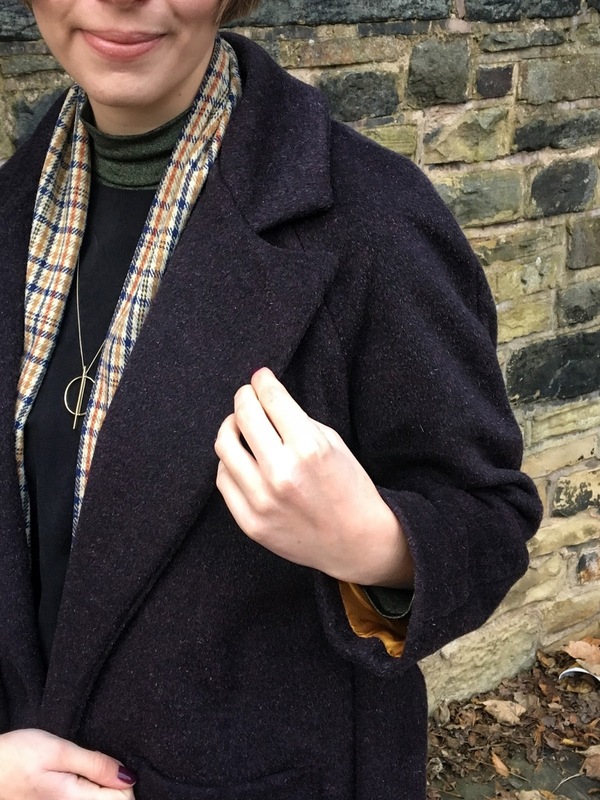 Despite some mixed feelings about the finished thing, I'm still very proud that I made a proper winter coat. And what's to stop me from making another one? Or another few? 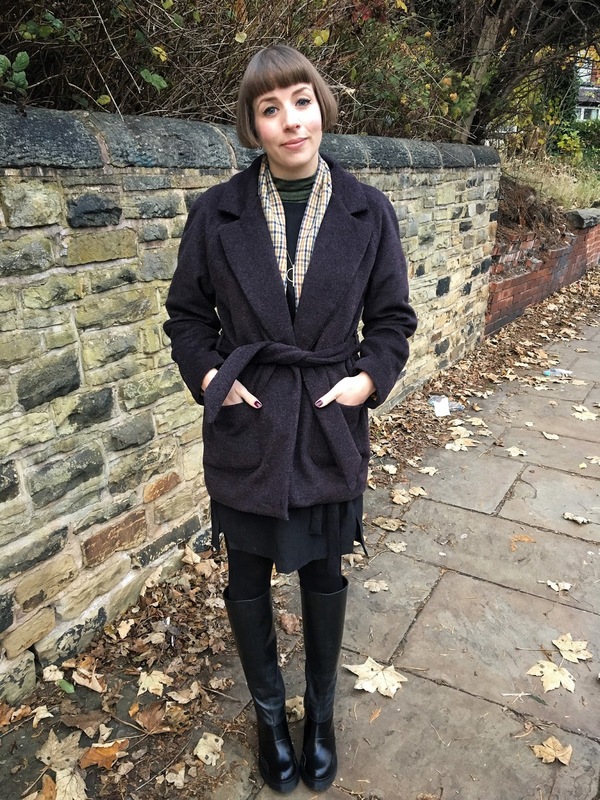 A coat for every occasion..! 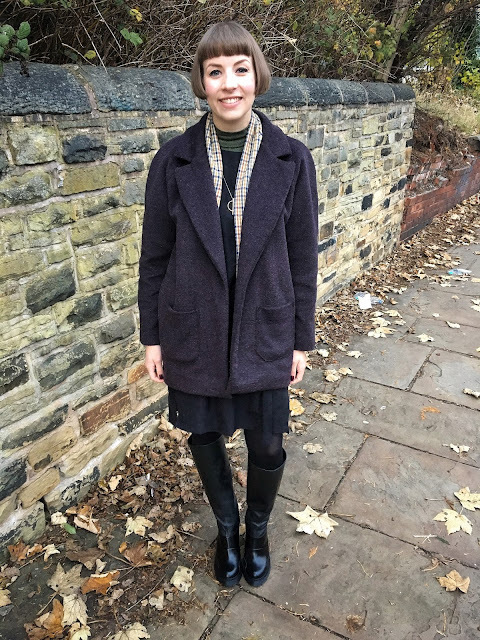 I've probably over-analysed the challenging aspects of the coat in this post, but it really was a learning curve, and I'm glad I chose the Yona pattern - my familiarity with Named patterns helped to bridge the gap with my total unfamiliarity with coat sewing. I feel like I could get at least one more use out of the Yona Pattern - it would be totally perfect (wrap belt included!) 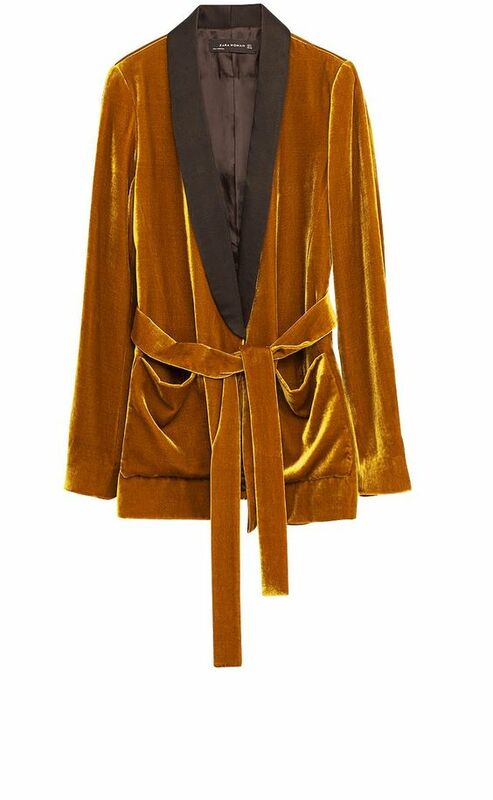 to replicate this velvet jacket in Zara at the minute. And in terms of general future coat sewing, I think new techniques such as welt pockets will be on the to-try list for next time - see Crab and Bee's Yona alteration for inspiration! I'll be wearing it with pride, and it's also a relief to know that I won't see someone else wearing the same coat on the walk to work everyday (it's definitely happened before)! I 'accidentally' bought 3m of grey leopard print wool at the Knit and Stitch Show this weekend - it might be a long time in the works, but any suggestions for a pattern I can use it with to make my next coat? Great job, yay coatmaking, the colour(s) is lush! I'm still wearing my Yona from last winter. I added a few inches in length and a single button front fastening as I didn't like the tie belt much either. It works OK but I'm craving a more fasten-able coat now it's starting to get proper chilly. I love this coat and you might have convinced me to give it a try. As for a discreet fastening, I used to have a fake fur coat that fastened with a big hook and eye sewn to the inside of each front piece; if you could find a set, that might work. You should be proud! This is a beautiful coat. This is looking great! I love your colour choices. I would go for one big metal popper if you can get hold of one - and maybe cover it in a scrap of the gold lining fabric? What a great make. Like the color mix of the coat fabric and the lining. How about a giant popper? 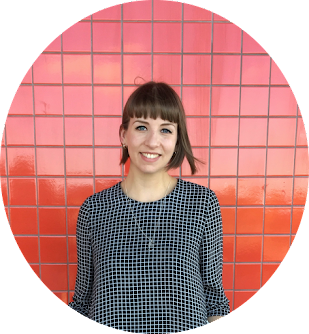 Love your fabric choice. The lining is a fun pop of colour. Wowsers!! This is absolutely brilliant, and I love the snazzy gold lining. This looks awesome! Love the gold/aubergine combination. Surprise linings are the best. I completely agree about the wrap belt. The coat's proportions look too short for it. A big snap/popper would be a nice, discreet fastening for your coat. I think Rosabella who does the "Sewn" vlog put some on her winter coat recently.